Breeders’ Cup Ladies’ Classic 2011 Report – Blind Luck is back! Blind Luck garnered a 96 BSF for her late running tally over Switch in the Grade 1 Vanity at Hollywood Park. Last year’s 3yo filly champ has now won back-to-back after landing the place in five straight. She goes next in the July 16 Del ‘Cap or the Aug 6 Clement Hirsch. Nine furlongs is not the best distance for Switch but she was hardly disgraced in the Vanity and it could have been much closer if Rosario pulled the trigger sooner. Last year’s BC Filly & Mare Sprint runner-up will probably target that race again but might stick to the route game for now. Santa Margarita winner Miss Match ended up a solid 3rd in the Vanity. She might be better on conventional dirt. St Trinians is clearly not the same mare that gave Zenyatta a scare in the 2010 Vanity. She runs well fresh and could use a bit of a breather. Unrivaled Belle flipped in the paddock prior to Belmont’s Ogden Phipps and was forced to scratch. The Mott trainee subsequently retired so there will be no Ladies’ Classic repeat for the daughter of Unbridled’s Song. Awesome Maria took full advantage of Unrivaled Belle’s absence in the Phipps and uncorked a 100 BSF for her winning effort. She is 4-for-4 in the graded ranks this year and look for the Pletcher trainee to show up at the Spa this summer. Life At Ten has not been the same since her infamous last place effort in the 2010 Ladies’ Classic and could hit the breeding shed in the near future if he career continues to sputter. Havre De Grace looked good capturing the Azeri, Apple Blossom, and Obeah to begin her promising 2011 campaign for Larry Jones. The Delaware Handicap is next and she could take on males later this year with continued development. Two graded routes on tap this weekend for sophomore fillies. Joyful Victory takes on Buster’s Ready in the Mother Goose at Belmont Park and Plum Pretty is the one to beat in the Hollywood Oaks. Joyful Victory is one of my favs but she will have to elevate her game in the coming months. She looked great in a pair of wins at Oaklawn (Honeybee, Fantasy) earlier this year but is 0-for-3 in Grade 1 races after a disappointing 4th in the Kentucky Oaks. The Mother Goose came up light and she is an obvious low odds threat. Buster’s Ready raced wide chasing a fast pace in the Black-Eyed Susan and was clearly second best behind visually impressive winner Royal Delta. The Todd Pletcher trainee continues to improve and could give Joyful Victory fits on Saturday. Alseera is a $500,000 Keeneland sales grad for Kiaran McLaughlin. She exits back-to-back wins and might get brave if able to shake loose early in the Mother Goose. Plum Pretty just lasted over St John’s River in the Kentucky Oaks and was supposed to go in the Mother Goose but a slight temperature altered her plans and she will now go in the Hollywood Oaks. Bob Baffert’s fleet filly should get a soft trip on or near tepid early splits at Hollywood Park on Saturday. Zazu rallied for the show in the Kentucky Oaks and has beaten Plum Pretty on two of three occasions. She needs pace help and won’t get it in the Hollywood Oaks. Big Tiz owns fine early-pressing speed and attracts PVal for her Oaks assignment. She could beat Plum Pretty if that one stubs her toe. The Kentucky Derby 2012 is only 11 months away, and already we may have our first contender in Majestic City. Majestic City, a 2-year-old son of City Zip, out of Meadowlake mare It’schemistrybaby, began his career with a sharp wire-to-wire win in a four and one-half furlong special weight event at Hollywood Park May 21. He returned on June 12 as the overwhelming choice in the $70,000 Willard Proctor Memorial Stakes and did not disappoint in a facile wire job triumph under David Flores. The $100,000 Grade 3 Hollywood Juvenile Championship at six furlongs is his next target and the $180,000 purchase is probably the one to catch in that July 17 synthetic sprint affair. Trainer Peter Miller had a case of Derby fever with Comma To The Top this year and he hopes fleet colt Majestic City will lead him back to Kentucky on the first Saturday in May. The 2012 Kentucky Derby will be run on Saturday, May 5. Ruler On Ice continued the three-year-old graded stakes upset trend with a surprising tally over Stay Thirsty and Brilliant Speed in the 2011 Belmont Stakes. The sloppy Belmont Park oval was favoring early-pressing speed throughout the day and the top two Belmont Stakes finishers made their presence felt throughout. Ruler On Ice has returned to his Monmouth Park base with the Haskell a logical target. His stablemate Pants On Fire goes in Saturday’s Pegasus at the Jersey Shore and also has an eye on the Haskell. Stay Thirsty and Brilliant Speed will likely spend the summer at Saratoga with the Jim Dandy and Travers on their radar screens. Belmont Stakes 4th place finisher Nehro came out of the race with a small bone chip in his right front ankle and will have surgery on June 15. Shackleford set the Belmont pace but came up empty late in a 5th place finish. He could not quite handle the marathon distance and should be much more effective in a race like the Haskell. Animal Kingdom clipped heels and jockey John Velazquez lost his irons in a disastrous beginning. The Derby hero ended up a better than appears 6th and will target the big summer races (Haskell, Travers). The rest were far back including the disappointing Master of Hounds, Mucho Macho Man, and Santiva. The latter reportedly did not handle the wet going. This year’s Triple Crown series was a wild ride of upsets and the 3-year-old title is up for grabs. What surprises are in store for the second half of the year? I can’t wait to find out…stay tuned! Mucho Macho Man appeared to be sitting on ready for the Preakness but a less than ideal start, wide journey, and another shoe episode derailed his chances. 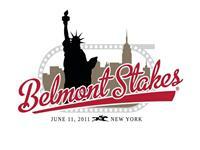 Can he rebound in the 2011 Belmont Stakes? Kathy Ritvo’s immature son of Macho Uno has been a trifecta player in 8 of 10 lifetime starts and he still won’t officially turn three until after the Belmont Stakes. Mucho Macho Man has plenty of graded experience (7 starts) with one win and four placings, including a show finish in the Kentucky Derby. He gets a rider switch to Ramon Dominguez and has been outfitted with a new pair of shoes. He has more speed than he showed in Kentucky and Baltimore and uncorked a five furlong Belmont Park bullet in :59.57 on June 5. Mucho Macho Man has the tactical speed and raw ability to compete in the Test of Champions. His long distance pedigree is less than stellar but he rates contender status in a wide open renewal of the Belmont Stakes. Monzon failed to hit the board in three prior graded stakes races and will attempt to turn things around in Saturday’s Belmont Stakes. The gelded son of ’95 Belmont Stakes hero Thunder Gulch has faced the starter eight times with three wins to his credit. He romped in a pair of flat mile starts in Maryland (dirt) and Delaware (turf) last year and started 2011 with an Aqueduct inner dirt tally in the Count Fleet Stakes, beating the likes of Pants On Fire. The wheels came off the cart with a non-threatening 5th in the Sam Davis and a 6th in the Peter Pan but he figures to be grinding away late. Hi aforementioned sire Thunder Gulch threw 2001 Belmont Stakes winner Point Given. Monzon will represent legendary Sagamore Farm and the late striding three-year-old will have to kick his game up a notch or two to compete for a minor award. A minor award in not out of the question. The distance of Belmont Stakes 2011should not pose a problem for Brilliant Speed but the conventional dirt footing is a question he must still answer. Brilliant Speed, trained by Tom Albertrani and owned by Live Oak Plantation, was beaten more than forty-lengths in a pair of dirt sprints to kick off his career in New York last summer. He showed signs of life in a pair of Belmont turf route show finishes before graduating on the Tampa Bay weeds in December. That turf maiden win seemed to do wonders for his confidence and he followed that up with a pair of near misses in the grass stakes ranks. He burst onto the Derby scene with a surprising late running tally in the Blue Grass Stakes and ended up 7th of 19 on the first Saturday in May. Brilliant Speed, a 3-year-old son of Dynaformer, out of Gone West mare Speed Succeeds, will once again have the services of leading Southern California rider Joel Rosario, and although the mile and a half Belmont Stakes distance should be well within his reach, he must still prove that he can run a big race on dirt. One of the most intriguing 2011 Belmont Stakes contenders is Uncle Mo’s stablemate Stay Thirsty. Trained by Todd Pletcher and owned by Mike Repole, Stay Thirsty began his career with a runner-up sprint effort at Belmont Park last summer. 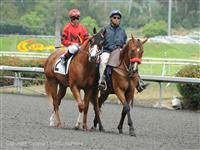 He easily earned his diploma at Saratoga second time out subsequently placed in the Grade 1 Hopeful at seven furlongs. Stay Thirsty returned from two-month break to finish a well-beaten 5th behind Uncle Mo in the Breeders’ Cup Juvenile. He went to Florida to prepare for his three-year-old campaign, which started off with a bang in Aqueduct’s Gotham Stakes. After the Gotham he returned to South Florida but wilted in the Florida Derby heat. He was hardly on top of his game for the Kentucky Derby and he barely made a whimper back in 12th. Stay Thirsty has yet to live up to his potential but the son of Bernardini (A.P. Indy), out of Storm Bird mare Marozia, is bred to handle the Belmont Stakes trip and looms a pace player at the very least under Javier Castellano. He has experience racing and training over the Belmont Park surface and could help his connections heal from the sting of Uncle Mo’s adventurous spring with a win in the Test of Champions.